Click to download and print the diagram. There are as many variations in the structure of flowers as there are in their color. Knowing the parts of the flower and the role that they play in the growth and reproduction of flowers gives one a much greater appreciation for such a fabulous design. 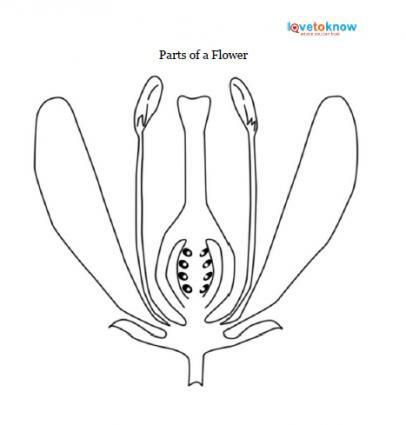 Using printable diagrams is a great way to teach and become familiar with all the parts of a flower. To download either the labeled diagram above or unlabeled printable diagram below, click on either the diagram itself or the caption. It will open using Adobe Reader. From here you will be able to either save the diagram or print it. The labeled diagram is helpful when learning the specific parts. Use the unlabeled diagram to test your knowledge. Click to download the blank diagram. 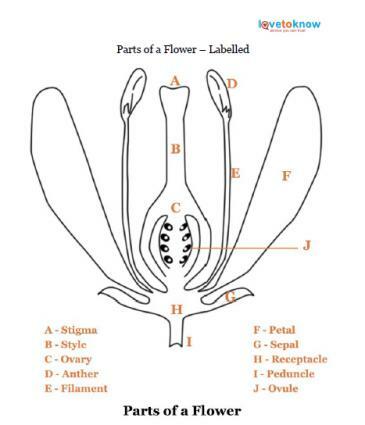 Although flowers can be made up of different parts, there are some parts that are basic to all - the reproductive parts. Without these parts, reproduction would not be possible. Anthers - These pouches are inside of the flower and hold the pollen grains. They are usually yellow in color. Filament - These thread-like structures hold up the anthers and play a supportive role. Stigma - This structure sits on top of the pistil and is sticky. Its main job is to trap and hold pollen. This starts the fertilization process. Style - This tube shaped structure is what holds up the stigma. Ovary - The style leads down to the ovary which contains the ovules. Ovules - These are the part of the ovary that becomes a seed. In addition to the reproductive parts, there are a number of other parts of a flower that are also highly important. Petals - Petals attract pollinators and are the attractive part of a flower. Sepals - Sepals are the green leaf like structures found at the base of a flower. Their main job is to protect the developing bud. Receptacle - This is the thick and flattened base of the flower that supports all the parts of the flower. Sometimes this structure curves around the ovary, partially or fully enclosing it. Peduncle - This stalk attaches the flower to the plant. If there are more than one flower on a peduncle, as in geranium, each flower has a pedicel to attach itself to the peduncle. Flowers can have all male parts, all female parts, or a combination of both parts. Flowers found on cucumbers, melons, and pumpkins have all male or all female parts; due to this, they are called imperfect flowers. Perfect flowers, including dandelions, roses, and lilies, have both male and female parts. When one really begins to uncover all the amazing parts of a flower, it is quite a complex operation. Although a flower may appear to be a simple statement of beauty on the outside, it is actually comprised of many important parts that function together to create beauty and secure future generations of plants.